This page gives a few illustrations of the use of the TFTB. 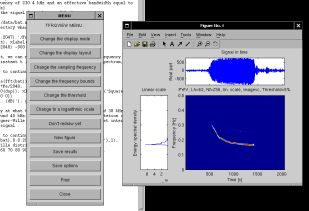 Several others examples can be found in the tutorial which comments and details the various demos. 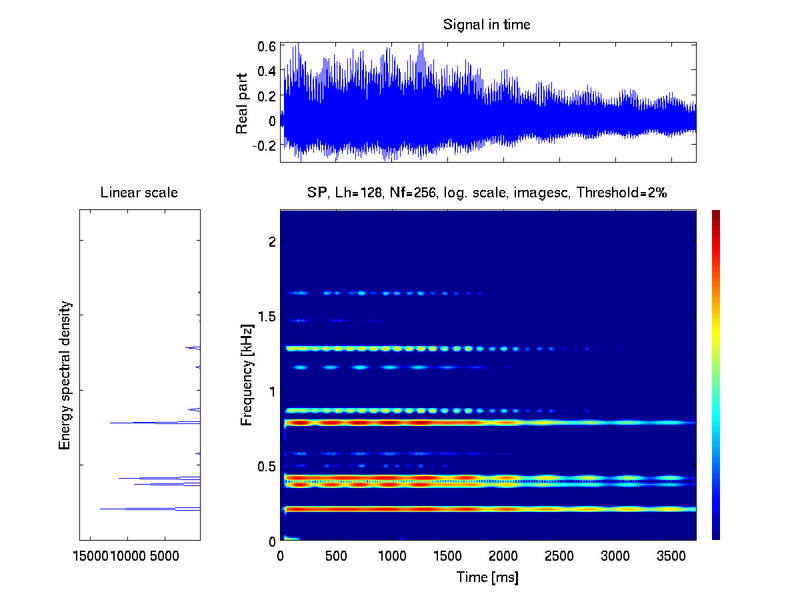 Let us consider for this first example, the simulated signal which we see the time representation in the plot on the left. 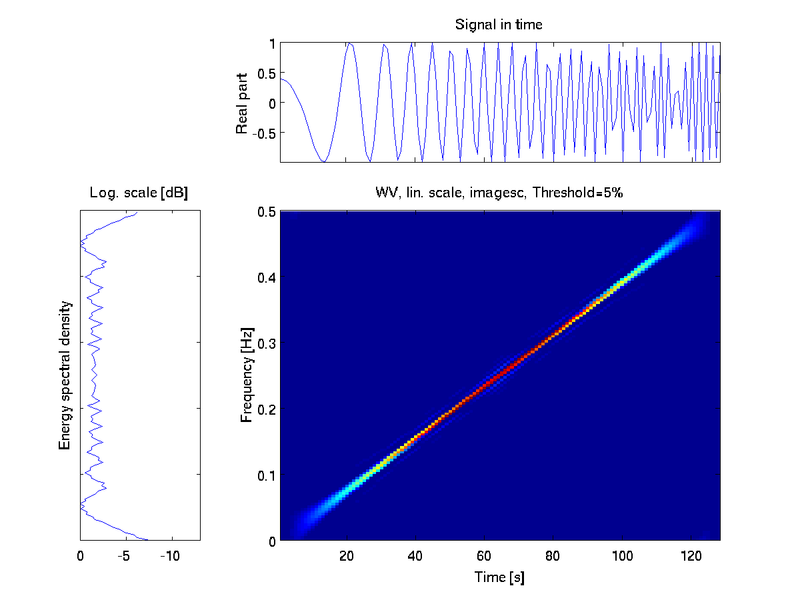 Clearly, this is an oscillating signal whose frequency varies with time. However, it is difficult to conclude from this representation on its type of modulation i.e., on the relationship between frequency vs. time. 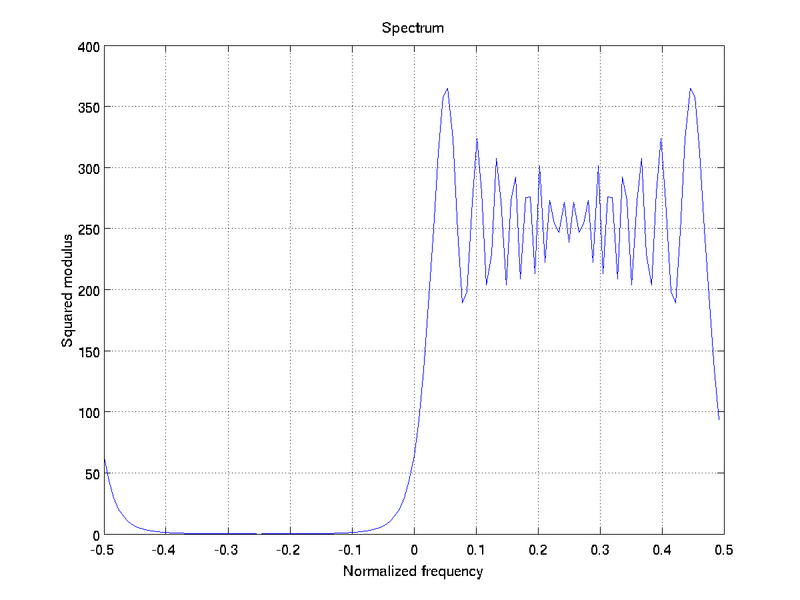 The spectrum of this signal does not give more indications, expect the fact that its frequency goes through the entire useful bandwidth (from f=0 [DC] to f=1/2 [Nyquist] using normalized frequencies). 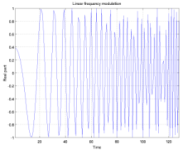 The objective of time-frequency analysis is to offer a more informative description of the signal which reveals the temporal variation of its frequency contents. 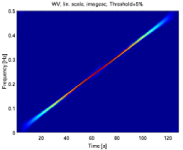 The plot on the right gives an illustration (here, given by the Wigner-Ville distribution). 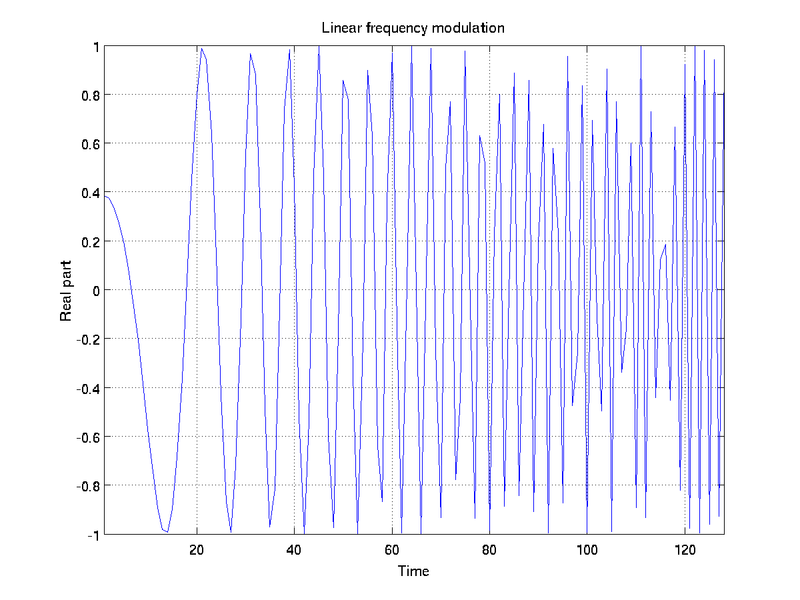 We see that the signal frequency is modulated linearly. 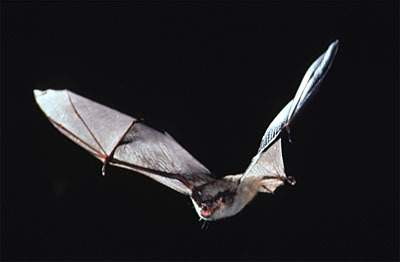 It is well-known that bats use their calls as a sonar to locate their preys : they make sounds (in fact, ultrasounds inaudible for us), listen to echoes and use this to sense and determine their environment. 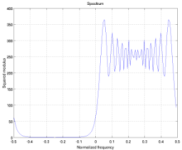 (The sound sample proposed here is a modification the original recording which brings by heterodyning the ultrasounds down to the audible frequencies). 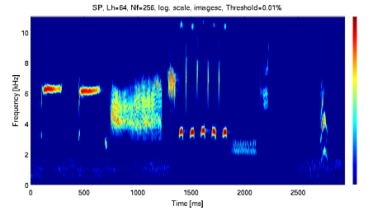 Several studies have demonstrated that time-frequency representations (such as the one presented here in the screenshot) of the calls give interesting indications on the type of signals used by bats, and thus on the way this biological sonar works. This is a time-frequency image of the sound of a gong. The sound is composed of a number of frequencies (horizontal lines in this time-frequency image) which fade out. Each of the frequencies are mechanical resonances (or modes) directly related to the shape and weight of the instrument. 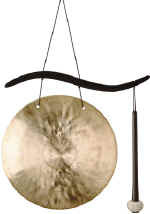 Gong and bells are usually tuned to a pitch. This means that the frequency of the fundamental mode which has the largest amplitude (darkest red in this picture) is adjusted to a given frequency. We see that the colors and thus the amplitude of certain lines changes as time goes. This is due to the beating of two modes with very close frequencies, an phenomenon which you can indeed perceive if you listen with attention. 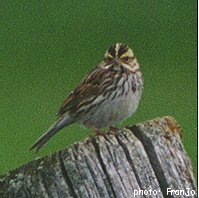 This is a time-frequency representation of the sparrow call. We see clearly the different phases of the call, and the ability of the animal to modulated rapidly its cry. This example demonstrates that a time-frequency representation can help to understand quickly what's happening in complicated data i.e., its phenomenology. 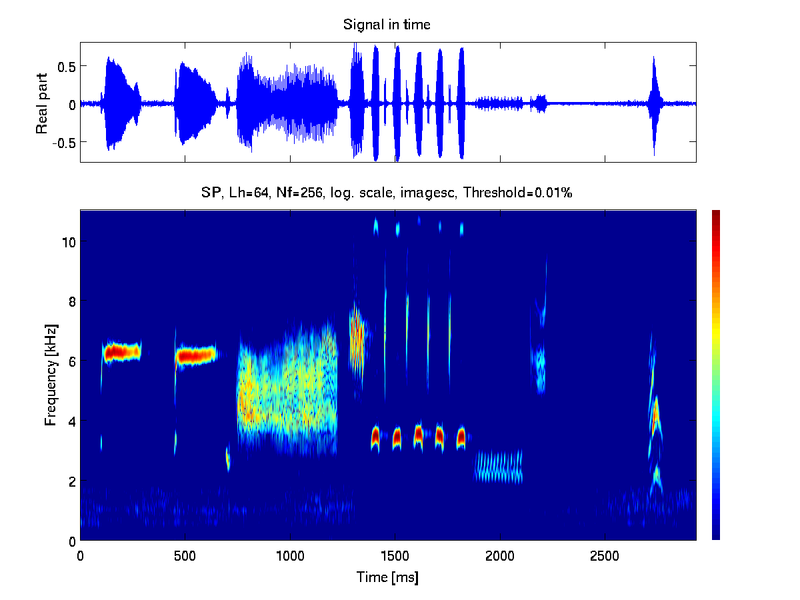 It is interesting to listen to the sound sample in a decelerated version (8 times slower) . 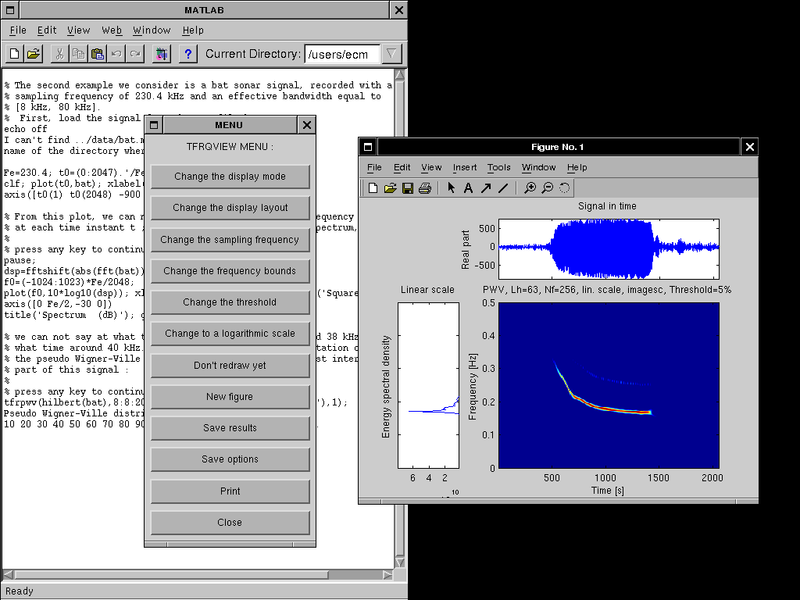 (Note that this transformation lowers the overall pitch of the sample.) 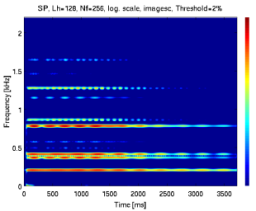 While listening, the time-frequency image can be used as a "music score": it is possible to make a correspondance between the patterns in the image and the successive parts of the call.